All-inclusive - lodging, meals, gear, instruction, guided fishing! 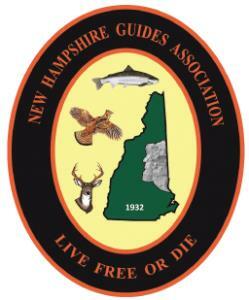 Make sure your guide is licensed, insured and a member of the NH Guides' Association. Learn to Fly Fish in 2019! New Hampshire Rivers Guide service is dedicated to providing you with a New England fly fishing experience that you will never forget. Whether it is a drift boat trip for trout and salmon on a major New Hampshire river, such as the Androscoggin or Connecticut ; a wading trip on a stream or the Pemigewasset River; or a canoe trip to a pristine New Hampshire brook trout pond, you will have the opportunity to view wildlife, enjoy wonderful natural sights and catch beautiful fish. A day fly fishing for trout and salmon with a New Hampshire Rivers guide will enhance your vacation or help you relax on a business trip to Boston, Concord, Manchester, Nashua, Portsmouth or North Conway. The experienced fly fishing angler will have the opportunity to match their skills against some of the largest, wariest fish in New England (and maybe even learn something new in the process.) Beginners will find expert fly fishing instruction, patient coaching and a friendly, positive attitude to help them develop their skills. We operate the Northeast Fly Fishing School to offer you the best possible fly fishing instruction at a very good price. Whether you come to our fly fishing school or take a guided trip, you will learn to fly fish on some of the most beautiful waters in New England. We teach you much more than just how to fly cast. Learn to fly fish from us and you will have a strong foundation on which to build a long future in this wonderful sport. Plan your New Hampshire Fly Fishing trip now! Whether it is a half-day wading or drift boat trip or one of our all-inclusive packages, we are committed to provide the most professional guided fly fishing trips in New England. Take a New Hampshire fly fishing trip with us, you'll be glad you did. Schedule your trip now to assure availability of prime dates for best New Hampshire fly fishing for trout, and good insect hatches for the peak season. Call or email now, while prime dates are still available! Want to get away for a few days to the North Country of New Hampshire for a fly fishing trip with your buddies or family, but are concerned about the high price of a remote NH fishing lodge? We have a solution for you! Every summer we time our fishing trips to the Great North Woods in northern New Hampshire to coincide with the best hatches of the year. The caddis and mayfly hatches emerge from mid-June into July on the Androscoggin River and other Great North Woods of New Hampshire rivers and ponds. In September the fly fishing is also great as the water cools and the fish pack on the protein for the spawn and winter. To take advantage of the great NH fishing we have put together some all-inclusive fishing trips. This all-inclusive Special Package is designed to offer great NH fishing at a great value! These trips offer great fishing experiences for our clients. See the YouTube videos of many of the client trips. These special package trips include lodging, meals, guided fishing, instruction as needed and free loaner gear. Watch the Flash video of the Dead Diamond River, the largest undammed wild brook trout river in New Hampshire. A special treat for clients who attend our Special Package trip. View our YouTube channel for HUNDREDS of fly fishing videos from New Hampshire and other parts of New England and western USA and Canada. A guided fly fishing trip or learn to fly fish lesson makes a great gift for an anniversary, Father's Day, birthday or any occasion! We email the pdf, so it's a great last-minute gift! Order a Fly Fishing Gift Certificate today! Howard Clowes and his wife and daughter visited Boston to look at colleges for his daughter. Howard wanted to experience dry fly trout fishing in NH. Here's what we found on the Newfound River. We often put fishing reports on the Fly Fishing New England Fishing site. Jim also submitted this fictional story to Fly Rod and Reel Magazine. New Hampshire Rivers Guide service provides licensed and insured fly fishing guide services throughout the State of New Hampshire, as well as northeast/central Massachusetts. Home waters are the central and southern sections of New Hampshire, but our fly fishing guides are knowledgeable of New England waters from Greater Boston to the Canadian border. We specialize in fly fishing, having decades of experience. The guides are refugees from corporate America, having traded in their laptops and pinstripes for breathable waders and fly rods. They are "students of the game" having fly fished throughout the U.S. from Maine to Florida and Arizona to Alaska and many points in-between. Active in Trout Unlimited, they participate in conservation and habitat restoration programs throughout New Hampshire. They have provided instruction in fly tying, and fly casting for many years and also operate the Northeast Fly Fishing School. "What a great time!!! It is amazing that I found your service with a simple internet search. I feel very lucky. I had a terrific time. Gerry and Jim, your patience, organization, and knowledge of the fishery were far above my expectations. To say nothing of your value proposition!! Barb, the food was fantastic. You all worked very hard to make this a very memorable flyfishing experience. I will definitely be back. Lastly, noteworthy was the fact that I caught my first fish on a dry fly. Thank You very much for a great couple of days in the North Woods of NH. - Regards, Ken Hammer, Chicago, IL"
"I can only say that my brother and I, who have done some guided fishing in the past, have never experienced guides who “put themselves out” to the degree that you Gerry and Jim do for your clients. The effort you both put into providing us with a satisfying fishing outing is unparalleled in our experience. But we’re not just giving you an “A for effort.” The wild brook trout fishing you put us onto was quite simply, and without exaggeration, one of the most unprecedented fishing experiences I’ve ever had. And I include my fly-fishing out West as well in that comparison." "The day was great, the area was beautiful, and the fish were healthy. Keep up the good work Gerry, in protecting the fish and enhancing the fish habitat. " "Having taken up fly fishing only this season (I blame my neighbor, Bob Wesolowski for getting me hooked on this wonderful sport), I was very much looking forward to fishing in New England. Since I was coming this way for business purposes, I hooked up with Gerry Crow to show me around. What a wonderful afternoon/evening I had with him! Not only did he show me some great streams to fish, but he also gave me fantastic advice on casting techniques and with fly fishing in general. Gerry, thank you for being so patient with a rookie like me and for showing me the ropes, which allowed me to catch several brookies that day. The evening was topped off with a canoe trip on a local pond (a first for me!). The hexagenia hatch was heavy and we had a fantastic time. Gerry even took some pictures of me releasing some of my 'trophies', which he put on the website, allowing me to share my experiences with friends. I would recommend Gerry Crow to anyone wanting to fly fish in New Hampshire and I hope that he will be available next time I'm in the area. Thanks Gerry!" NH Rivers Guide Service is a registered trademark of NH Rivers Guide Service copyright 2018-2019 all rights reserved.